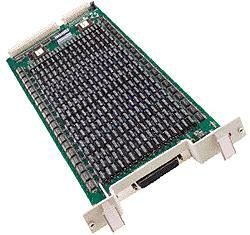 Multi-Channel Programmable Discrete Output GTXI Card - GT7864 Series | Marvin Test Solutions, Inc. The GT7864 is a multi-channel programmable discrete output board that provides test engineers with multiple discrete outputs for avionics and other ATE testing applications. The GT7864 provides 32 or 64 output channels (depending on the model) and four Voltage Rails. Each of the output channels can be set to High, Low, or Open state. Voltage Rails A through D are voltage sources for the High and Low states. The GT7864 occupies one GTXI slot and is available in four versions, A through D. Models A and B provide 32 output channels, while models C and D provide 64 output channels. The GT7864 provides self-test capabilities using a measurement channel (at the GT7864's connector). The measurement channel may be routed to any of the four Voltage Rails using software, thus allowing direct access to the internal DACs for calibration and BIT. The four DACs and four external sources are also routed to the GTXI's local bus connector. The internal bus allows multiple GT7864s to share voltage sources. The GT7864 provides an onboard EEPROM that contains the DAC calibration parameters and the output channel-to-voltage rail assignment information. The board is supplied with a 32-bit DLL, 16 bit DLL and DOS static libraries. Various interface files provide access to the DLL from programming tools and languages such as ATEasy, LabVIEW, C/C++, Microsoft Visual Basic®, Delphi, and more. The available virtual panel can be used to interactively adjust and control the instrument from a window that displays the current instrument settings and measurements.